Look, the man in the video was clearly in a no win situation. He had a cat on his windshield and he wouldn’t want to drive with a cat on his windshield now, would he? But then again, why couldn’t he just use his car horn or the windshield wipers to scare away the cute little guy? Why did he have to kick the darned windshield!? Don’t you know how weak glass is?! Come on! 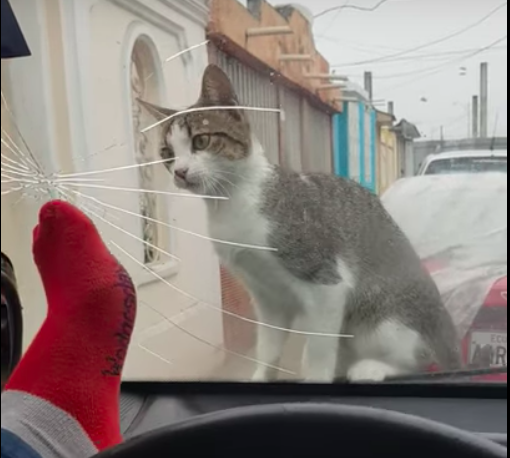 Well, check out the heart/glass breaking clip below, and enjoy the sight of a cute little kitty cat getting the best and one over a foolish human, as the animal kingdom in my opinion is always meant to do. Like the might Looney Tunes before them, like the incredible animals of Aesop’s Fables, or like a cat who gets you to kick in your own windshield with a foot most besocked, the animals got it over the humans on this one. The kicker, still unidentified, told Viral Hog: “I was resting in the car when a cat approached the front windshield. I wanted to scare him with my foot but apparently, I hit the glass way too hard and the glass broke.”. Hmm. Seems like a pretty sober description of the video I just saw. I want some insight! Who was your inspiration for the kicking of the windshield!? Was it Jason Statham!? Bruce Lee!? The Spider-Man game where I kick through glass all the time, but for some reason don’t get hurt at all? Look, pretend I’m James Lipton. Take a deep breath. Can we talk to… the windshield kicking man? Thank you, windshield kicking man. Now let me talk to the cat. Cat. How did you prepare for the part of being cute? 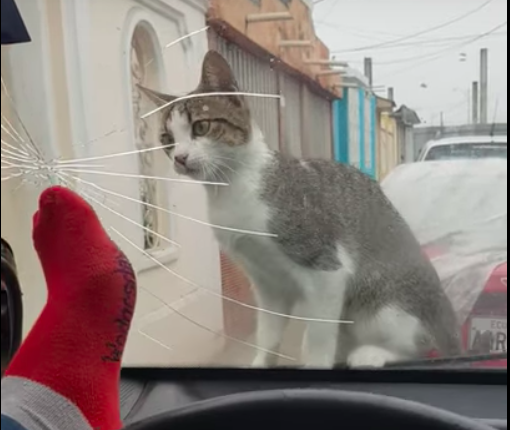 What do you think of the windshield kicking video? Let us know in the comments or on Twitter at @WhatsTrending.